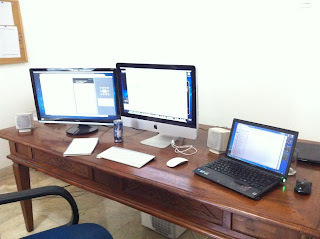 It is quite the norm now to use multiple monitor setup for software development. 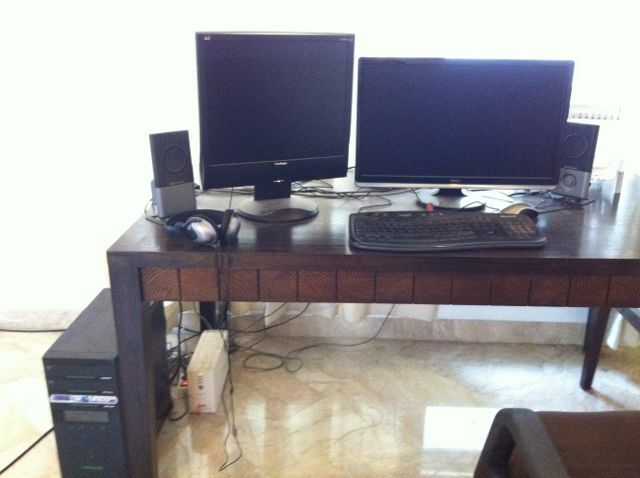 It used to be that dual monitor setup is quite hot but now three monitor is already quite common. However, I find it better to have 2 + 1 setup instead of going to 3 monitor setup (with "+ 1" being a screen of another device ). I have only certain space at one time (not to mention attention) and with several devices and gadgets I use, they all have to battle for the space in my workspace. So, I set aside one side for secondary device instead of third monitor. I find it more useful this way since I have more flexibility with the third space which I can use for Laptop, Tablet or even Books when needed. Also, if I want to breath a little I can just clear it up (or have there a snack, tea or whatever). 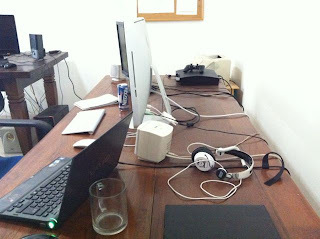 Below is my current workspace following the above setup. With the above setup, I have quite generous leftover space as below. As you might see, there is still some space free for support stuff. That is PS3 on the far corner for those stressful times :), connected to the secondary monitor (Dell monitor) that has comfortable source auto-switch. And here's my Windows workspace which has the blank right space to be used for the +1 as the above setup i.e: for non-desktop devices. As you might notice, I am generally a desktop guy. I don't like working on laptop so much (at least for major development work) unless I really need to. I find the +1 screen can function as third monitor quite easily e.g: opening references, utilities and even with more flexibility. The downside is that it has no direct computing connection to the main machine which break a flow a little compare to having the keyboard and mouse interacting with the integrated three screen. This can be helped a little using stuff like cloud, file sharing, bonjour protocol, etc.